Many PCR-based molecular diagnostic tests utilize a hot-start thermostable DNA polymerase. The hot-start format of these Taq DNA polymerase products are preferred because of their ability improve the specificity of the amplification assay by reducing non-specific amplification. Hot-start Taq DNA polymerase enzymes reduce non-specific amplification by temporarily blocking Taq DNA polymerase function through either chemical modification, aptamer, or antibody blockage of polymerase function until heated at a high temperature that restores polymerase function. The enzyme GoTaq® MDx Hot Start Polymerase (cat# D6001) is supplied by Promega labeled as a General Purpose Reagent intended to be used as a component of PCR-based molecular diagnostic amplification assays. The enzyme is supplied without requiring additional license or royalty payments for use in clinical applications. GoTaq® MDx Hot Start Polymerase is manufactured under Promega’s rigorous quality management system which has been certified to ISO 13485 and ISO 9001 standards to meet the stringent quality requirements for clinical applications. Promega’s GoTaq® MDx Hot Start Polymerase is an antibody-mediated hot start polymerase where the GoTaq® DNA Polymerase is bound to a proprietary antibody that temporarily blocks polymerase activity below 70oC. The polymerase activity is restored during the initial denaturation step of a PCR amplification where the reaction is heated for 2 minutes at 94-95oC. (1) Hot-start PCR allows convenient, room-temperature reaction set-up and is advantageous for some amplification targets by minimizing or eliminating primer-dimer and secondary product amplifications. The result is a more specific amplification that my result in higher yield. Furthermore, the enzyme is formulated in a proprietary cationic detergent which provides superior stabilization of the enzyme under PCR conditions. 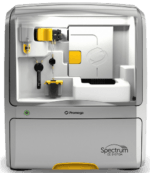 Users are not required to acquire further license or pay royalties for the clinical use of Promega’s GoTaq® MDx polymerase products. Each lot of enzyme is tested to contain less than 10 copies of bacterial genomic DNA, 1 genome equivalent of fungal genomic DNA, and1 genome equivalent of mammalian genomic DNA. Each lot of enzyme is tested to contain undetectable amounts of exonuclease, endonuclease, nicking and ribonuclease activity. Each lot of enzyme is tested to perform quantitative amplification of a DNA target. Additionally, hot-start function is tested by amplifying a hot-start model template that produces a single 1.5kb band without extraneous bands. The enzyme is stable for 24 months from date of manufacture. Utilizing a hot start Taq DNA polymerase improves assay specificity by decreasing the probability of non-specific amplifications. PCR amplifications were assembled using either non-hot start GoTaq® MDx DNA Polymerase or GoTaq® MDx Hot Start Polymerase and primers specific for a 1.5 kb sequence encoded by a plasmid included in the reactions. Mis-priming with this model is well-characterized (data not shown) and results in formation of a 410 bp product. Reactions were assembled at room temperature and incubated at 22oC for 3 hours prior to thermal cycling to encourage mis-priming. Following thermal cycling, reactions were analyzed with an Agilent 2100 Bioanalyzer. The resulting electropherogram of the non-hot start reaction (left panel) shows the presence of both the 1.5 kb amplicon and the 410 bp mis-priming product whereas the electropherogram of the GoTaq® MDx Hot Start Polymerase reaction (right panel) shows only the desired 1.5 kb amplicon. This demonstrates the specificity provided by GoTaq® MDx Hot Start Polymerase. Green and purple arrows indicate side standards. Sensitivity was examined by comparing the performance of eight commercial hot-start Taq DNA polymerase products, including GoTaq® MDx Hot Start Polymerase. Using the manufacturer’s recommended PCR conditions, a 2.4kb target of the ademonatosis polyposis coli (APC) gene was amplified from 104, 103, and 102 copies of genomic DNA (cat# G3041). Under these test conditions, the GoTaq® MDx Hot Start polymerase enzyme demonstrated greater sensitivity by amplifying the APC gene from 102 copies whereas the other hot-start DNA polymerases required 103 copies. A multiplex amplification of seven loci were amplified in a single reaction using fluorescently labeled primers and the amount of amplified product was compared when the amplification was performed using either GoTaq® MDx Hot Start Polymerase or AmpliTaq Gold® DNA polymerase. 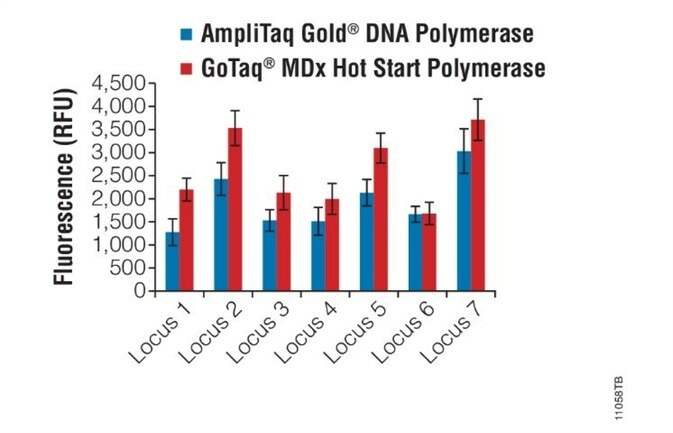 Reactions performed using the GoTaq® MDx Hot Start Polymerase show robust multiplex amplification and performed as well as or better than AmpliTaq Gold® DNA polymerase under the same conditions. Robust and reliably performing amplification-based molecular diagnostic assays require a rigorous characterization assay parameters. Guard-banding of PCR reagents and assay conditions to achieve the optimally performing formulation necessitates the need for a variety of enzyme formats and may require the ability to finally customize the enzyme format specific to the application’s requirements. Promega’s GoTaq® MDx Hot Start polymerases are all manufactured under cGMP and available in a variety of standard formats, including a glycerol-free product that is suitable for further manufacture processing and lyophization. (Table 1) Additionally, any of the GoTaq® MDx polymerases can be formulated to any custom concentration between 5 to 80 units/ml. Standard product formulation. Enzyme concentration ≥ 5u/ml. Actual unit activity reported on product’s certificate of analysis. The glycerol-free product formulation that is suitable for further manufacturing and lyophilization. Enzyme concentration ≥ 5u/ml. Actual unit activity reported on product’s certificate of analysis. A high-concentration formulation suitable for performing guard-banding experiments or applications requiring more units of enzyme. Enzyme concentration ≥ 50u/ml. Actual unit activity reported on product’s certificate of analysis. For clinical laboratories, Promega’s GoTaq® MDx Hot Start polymerase is an ideal solution. The enzyme is a general purpose reagent intended to be used as a component in amplification-based molecular biology assays. Produced under cGMP, within a rigorous quality management system, ensures consistent product performance lot-to-lot. GoTaq® MDx Hot Start polymerases can perform sensitively with specificity in common clinical diagnostic applications like real-time quantitative PCR. Custom formulations of the enzyme further provide the capabilities to optimize the enzyme specific to the needs of the amplification assay. Knoche, K. et al. (2008) Get the convenience of hot-start PCR with the new GoTaq® Hot Start Polymerase. 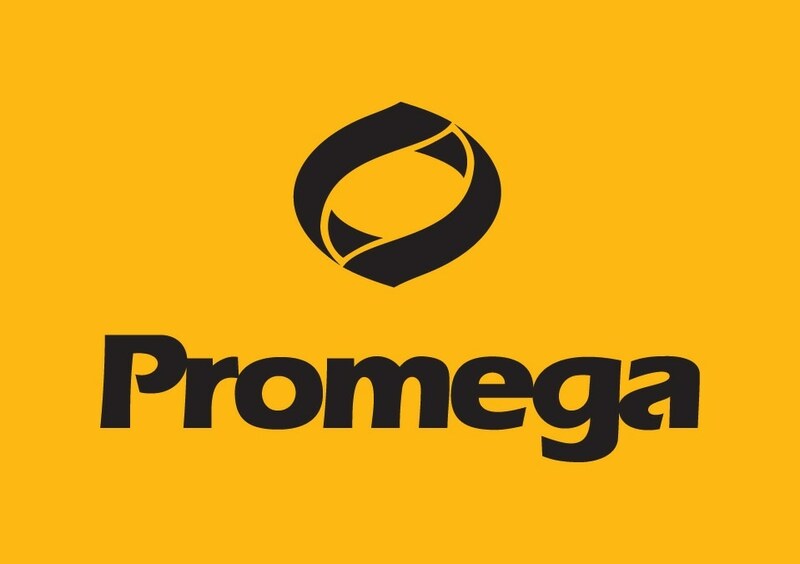 Promega Notes 99, 8-11.